Pristine in-town charmer defines the best of Americana classics! Beautifully maintained, remodeled, & expanded! 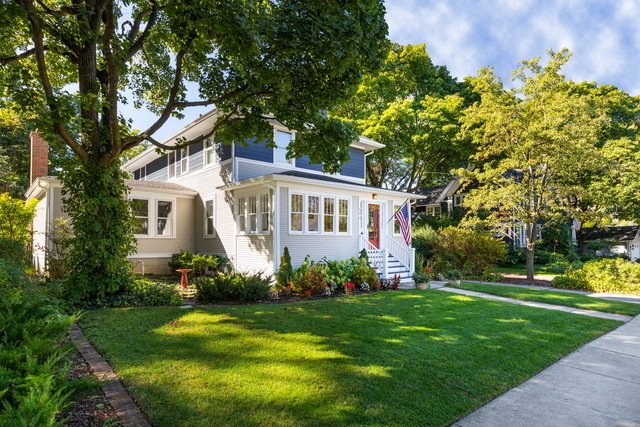 Sun-kissed rooms showcase gleaming hardwood floors and true craftsman&apos;s millwork throughout. Custom kitchen w/ bells & whistles, movable island w/ chopping block, subway tile backsplash, large planning desk, stainless appliances, & gorgeous backyard views from the large eating area & Family Room. Versatile 1st floor MBR suite could easily be used as an in-law suite, nanny&apos;s quarters, or private office. Family room w/ vaulted ceiling & woodburning fireplace for cozy evenings. Three large BR&apos;s upstairs w/ generously sized closets that are surprising! Bedroom 2 could easily accommodate an ensuite that shares a wall with the hall bath. Spring and Summer seasons highlight front & back landscapes that come to life w/ perennials & even a butterfly garden. Enclosed front porch & lovely backyard patio to enjoy the views. Walk to town, Metra, schools, & Northside Park! Perfect!